As someone who has possibly opened the door to techno and tech house for a generation of clubbers with his Miracle, Brave New World and Hey! 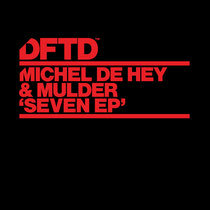 labels, Dutch producer Michel de Hey has now joined forces with fellow countryman and rising DJ Mulder to release their ‘Seven EP’ on Defected’s DFTD imprint. Title track ‘Seven’ is an eight minute journey that weaves its way through an array of shuffling transitions and cosmic overtures. ‘Trieb' boasts a huge, rocky bassline complimented by whisking vocal waves, while ‘Balicoon’ is the icing on this EP, demonstrating the duo’s versatility in threading evolving, saw tooth basslines, off-beat cowbell riffs and soaring ‘80s synth pads.